Core values are defined as guiding principles that dictate internal conduct as well as a business’ relationship with the external world. The core values are seen most commonly in the form of a mission statement. If you are an entrepreneur about to open your own small business, you are going to need to define your core values. These core values will set the tone for your business success, employees and customers. This can be a lot of pressure. After this post, you will be able to define your core values with ease. This post will pose you with the questions you will need to ask yourself in order to realize your business’ core values definition. But before you ask these questions of yourself, understand the purpose of doing so. Your business must be absolutely, entirely authentic. There are many examples of companies that seem to view the development of core values as a marketing project. However, authenticity is key when it comes to developing and launching your core values. Core values for business should actually reflect not only the organization itself, but also how the organization operates and interacts with its community of stakeholders, customers, clients and other participants. When asking yourself the questions below, make sure you are authentic in your responses to determine a true core values definition for your business. What environment do you hope to create for your employees? This is one question you must ask yourself in order to find the definition of core values for your business. This will help you to figure out how to engage employees in the best manner for your business. Do you want honesty to be the priority for your business? Or, perhaps you are more concerned with accountability and responsibility. Finding the answer to this question will help you to define the core values of your business. Whether you prioritize community involvement or workplace safety can greatly influence the environment you build for your employees in the future. Keep this in mind. Make sure to answer this question. Once you know what type of environment you hope to create for your future employees you will have defined at least one core value for your business. You should also consider the environment you would like to create for your clients, as this will certainly affect other areas, like product design, as well. Perhaps you are looking to make customers’ lives as simple as possible. You could also be more concerned with providing their services with utmost speed. Envision the environment you hope to create for customers in order to further define your business’ core values. For example, if you are primarily concerned with providing services as quickly as possible, customer service quality may suffer. Or, perhaps if you greatly value customer service, your employees may not be as productive as you would expect. Once you understand the environment you would like to provide your future customers, you will have a more comprehensive definition of your small business’ core values. You probably have a set of personal core values. This is an important consideration when finding the definition of core values for your small business. Your business is a reflection of you. It would not make sense for the values of yourself and your business to not align. So ask yourself – what traits do I value in my personal life? You are definitely a hard worker, so perhaps you value commitment to a task. Maybe, because you are such a hard worker, you have learned the value of work-life balance. Know your core values. Then, understand how your core values can help you to shape the definition of your business identity. This post has provided you with helpful questions to determine the definition of core values for yourself and your small business that you will not learn in any executive MBA programs. Defining core values for your business will set you up for success. Remember to ask yourself what type of environment you hope to create for workers and customers alike. Do not forget the importance of your own personal core values as well. Your business is a reflection of you. Therefore, your core values should be reflected in those of your business. Once you have figured out the answers to these questions, you will have a decent list of core values. 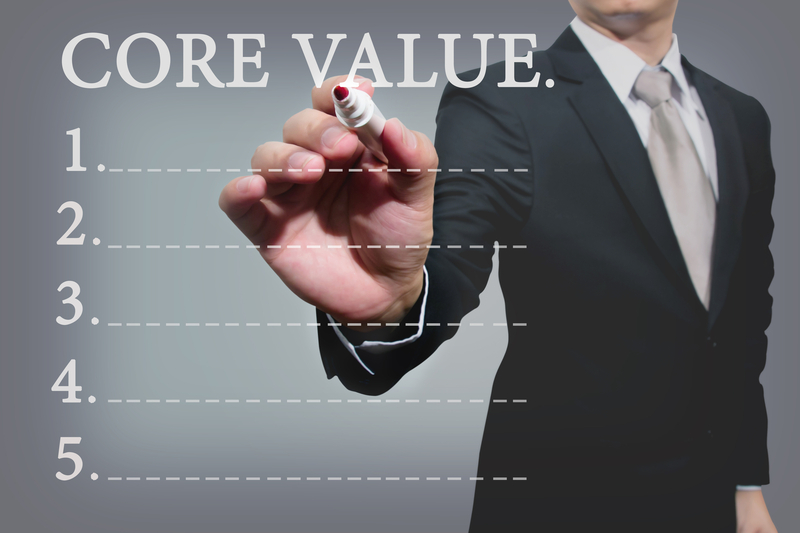 Define these values and their relation to your business. If done genuinely, you will be setting yourself and your business up for a lifetime of success.